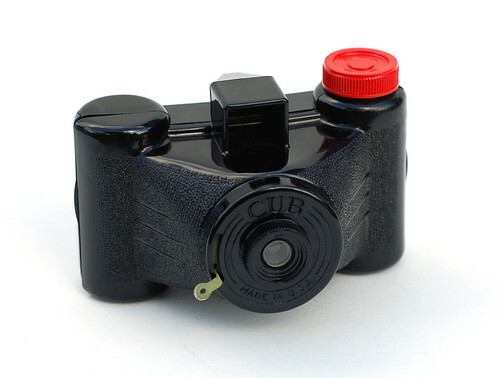 This cute little plastic camera item was made by the American Advertising and Research Corporation of Chicago, Illinois USA. It was sold in 1940 for 15 Cent to customers who also bought a carton of any Pepsodent product. It made 28×40mm exposures on type 828 film rolls. The Cub was also made with the name "Scenex", with a white winding knob, by Earl Products, 701 Sanamon St, also in Chicago, and named Snappy pocket size camera - also with white winding knob. This page was last edited on 13 March 2019, at 07:20.